The product selection, layout and overall feel of the True Swords web site has been inspired by a number of different cultures. This includes heavy inspiration from both Chinese and Japanese civilization. Upon viewing the Nine-Dragon Wall located in BeiHai Park, Bejing, our designer became impassioned with the idea of modeling our graphics after this beautiful work of art. 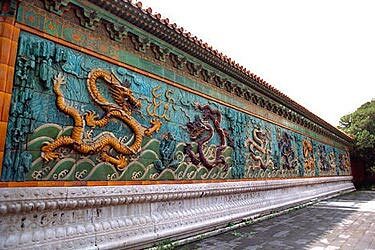 There are three Nine-Dragon Walls in China. The biggest and oldest of which, located in Datong, Shanxi, was built during the Liao Dynasty (916~1125 A.D.). The most sophisticated and beautiful one is the one in BeiHai (North Sea) Park in Bejing. The third wall is in front of the Ningyong Gate in front of the former Imperial Palace. The main body of the walls are engraved with nine huge dragons, and each dragon is playing with a unique jewelry ball. The dragons were painted in different colors with a three dimensional visual appearance, and were handcrafted with the highest level of workmanship. The wall in BeiHai Park was built in 1756. It is 21m. long, about 15m. high, and 1.2m. thick. 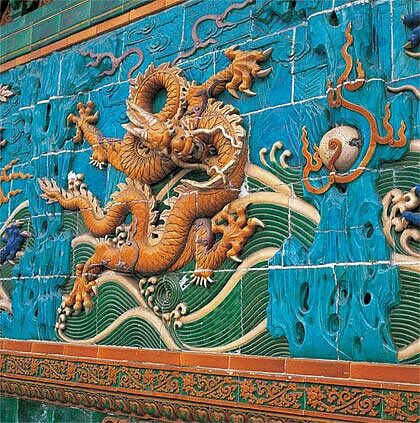 It is faced with 424 seven-color ceramic tiles, and after hundreds of years the colors of the tiles remain brilliant. 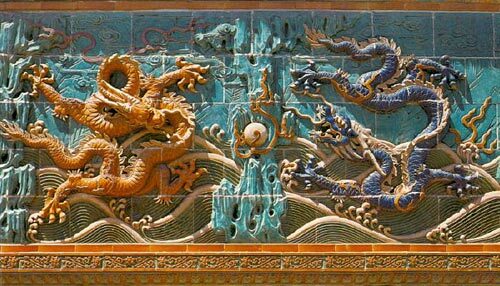 In the center of the wall is a giant dragon, flanked by four dragons on each side. In addition to these nine large dragons are 626 smaller dragons spanning edge to edge, totaling 635 dragons in all.